Tending to the Holy: The Practice of the Presence of God in Ministry invites pastors to embody their deepest beliefs in the routine and surprising tasks of ministry. 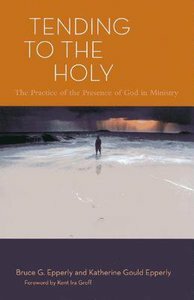 Inspired by Brother Lawrence's classic text in spirituality, Tending to the Holy integrates the wisdom and practices of the Christian spiritual tradition with the commonplace practices of pastoral ministry. Bruce and Katherine Epperly utilize a variety of spiritual disciplines especially Benedictine, Celtic, Ignatian, Rhineland, and process spiritualities to provide a framework for helping clergy nurture the awareness of God, creative imagination, and personal well-being in every aspect of their ministerial lives. Practicing God's presence in the ordinary tasks of ministry inspires wholeness, spiritual transformation, vision, imagination, endurance, and healthy self-differentiation in ministry. Commitment to joining spiritual practices with the routine and repetitive tasks of ministry provides an important antidote to unhealthy stress, burnout, and loss of vision in ministry. By seeing their congregational leadership in terms of spiritual transformation, imaginative practice, and relational interdependence, ordinary ministerial practices can become ways pastors can deepen their relationship with God. Growing out of their work with pastors at every season of ministry, as well as combined ministerial experience of nearly sixty years, Bruce and Katherine Epperly invite pastoral leaders to complement and expand on their understanding of spiritual leadership, pastoral excellence, and self-care, integrating traditional and contemporary spiritual practices with the concrete arts of ministry. About "Tending to the Holy"
Bruce G. Epperly is Director of Continuing Education and Associate Professor of Practical Theology at Lancaster Theological Seminary in Lancaster, Pennsylvania. A minister of the United Church of Christ and the Christian Church (Disciples of Christ), he is author of many books, including "God's Touch: Faith, Wholeness, and the Healing Miracles of Jesus" and "Walking in the Light: A Jewish Christan Vision of Healing and Wholeness", cowritten with Rabbi Lewis Solomon.